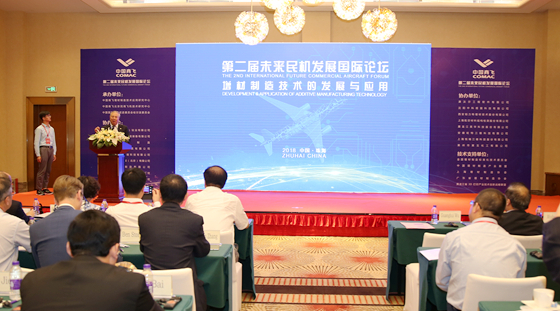 2nd International Future Commercial Aviation Development Forum Focuses on 3D Printing__Commercial Aircraft Corporation of China, Ltd. The 2nd International Future Commercial Aviation Development Forum themed with "development and application of additive manufacturing technology" was held during the 12th China International Aviation & Aerospace Exhibition on November 17th, 2018. Sponsored by Commercial Aircraft Corporation of China, Ltd. (COMAC) and jointly organized by COMAC Additive Manufacturing Technology & Application Research Center and Harbin branch of China Council for the Promotion of Trade, this forum aims to build an international exchange platform for civil aviation, promote the international cooperation and development of additive manufacturing technology & application in aviation industry and promote the improvement of new technology development ability. Leaders and experts from governmental organizations, industry alliance, renowned aircraft manufacturing enterprises and scientific research institutions of nations including China, the USA, the UK and France attended the forum. 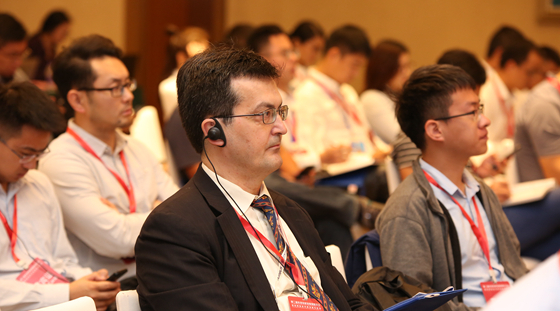 Mr. Wu Guanghui, Academician of the Chinese Academy of Engineering and Vice President of COMAC, attended the forum. Additive manufacturing, known as 3D printing, is a strategic technology concerning the spanning development of manufacturing industry. It is a manufacturing technology that produces physical objects using a manufacturing method of accumulating materials from the bottom up and stacking up materials layer by layer by means of squeezing, sintering, melting, light curing and spraying. Compared with traditional processing mode, additive manufacturing technology can be used to realize the mould-free, quick, fully dense and near-net forming of high-performance complex structural parts, has the advantages of autonomous design and being environment-friendly, providing new solving ideas for critical questions like realizing the optimization of complex structures, rapid design verification, quick manufacturing of small batch of parts and quick customer response for civil aircraft industry. COMAC Additive Manufacturing Technology & Application Research Center was founded in 2017, aiming to further improve the advanced manufacturing technology, and enhance the application research, verification and generalization capacity of additive manufacturing technology in commercial aircraft. Eleven representatives and renowned experts and scholars from global commercial aircraft major makers, suppliers and aviation technology research and development institution and made keynote speeches during the forum to introduce main development trend, vision and idea, and important action plan of future additive manufacturing and technology development of international aviation industry, and presented ideas on important issues related to future additive manufacturing and technology development through interactions and communications. Mr. Zhang Jiazhen, director of COMAC Additive Manufacturing Technology & Application Research Center expressed in his speech that the complex structure and high requirement for accuracy and performance of the aviation equipment made the manufacturing process rather complex and time costing. Additive manufacturing process indicates a significant advantage in integrated forming and topology optimal structure production. Meanwhile, additive manufacturing technology can unchain the designer's inspiration and shorten the development period and manufacturing process of the aviation equipment, thus lowering the cost. Mdm Elisabeth Martin, Vice President of Boeing (China) Research and Technology, expressed that the integrated forming by additive technology could not only reduce the structural parts, simplify structural assembly, reduce the structure weight, but also reduce the number of suppliers, thus reducing the program investment and creating more value for the customers. Boeing has more than 60 thousand additive manufacturing parts that have been applied in aircraft products so far. For example, an assembly of Boeing 787 Dreamliner manufactured by Boeing and Norsk Titanium in 2017 is the world's first titanium part of additive manufacturing structure certified by FAA and used in commercial aircraft. Mr. Michel M TRAN VAN, President of Airbus (Beijing) Engineering Technology Center, expressed that the introduction of additive manufacturing technology would greatly improve the utilization rate of materials, reduce waste and lower cost, making future aircraft quieter, cleaner and more environment-friendly. Scholars that participated in the forum believed that as for cost advantage, if "additive idea" was used in the process of structural design, thus manufacturing additive design structures rather than traditional design structures with the additive process, the cost would be greatly lowered. 3D printing technology exhibition and "1st COMAC 3D Printing Structural Optimization Contest" creative exhibition were also held during the forum.